St Johnstone v Hearts preview: Berra rested? | Godinho to play? | Lee to start? Hearts travel to Perth this evening on Ladbrokes Premiership duty looking for their first win at McDiarmid Park since November 2010. However, they will take on a St Johnstone side brimming with confidence after picking up five wins and a draw from their last six matches – and six clean sheets. The last few meetings in the Fair City have been cagey affairs, with tonight’s match unlikely to be vastly different. Hearts boss Craig Levein has admitted he could rest captain Christophe Berra, who returned to action ahead of schedule against Rangers at the weekend, but Michael Smith could continue in central defence with Marcus Godinho holding on to the right-back berth in a 4-1-4-1 formation. Ben Garuccio is likely to continue at left back with Demetri Mitchell among the substitutes, while the midfield five will likely comprise Peter Haring at the base, with Sean Clare and Arnaud Djoum in the wide midfield roles and Oliver Bozanic partnering Olly Lee in the centre, with striker Steven MacLean up top. St Johnstone are without defensive duo Steven Anderson and Brian Easton, while winger Drey Wright is also sidelined through injury. Former Jambos Danny Swanson and Ross Callachan are likely to be among the substitutes. St Johnstone - Manager Tommy Wright is without Steven Anderson and Brian Easton, goalkeeper Connor Mitchell and Drey Wright through injury, but has no players banned for the visit of Hearts. 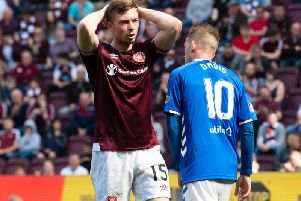 Hearts - No suspensions for Hearts either but centre-backs Jimmy Dunne and John Souttar and strikers Uche Ikpeazu and Steven Naismith are all out. St Johnstone: Clark, Foster, Shaughnessy, Kerr, Tanser; Alston, Davidson, Craig, Wotherspoon, Kennedy, Watt. Subs from: Hurst, Gordon, Comrie, Swanson, Scougall, McMillan, Nydam, Callachan, Kane, Davidson. Hearts: Zlamal, Godinho, M Smith, Berra, Garuccio; Djoum, Lee, Haring, Bozanic, Clare; MacLean. Subs from: Doyle, Hughes, Dikamona, Mitchell, Cochrane, McDonald, Amankwaa, Norrison, Mulraney, Wighton. Magic number: 5 - the number of league matches Hearts have gone without even scoring at McDiarmid Park. The last top flight match in which Hearts scored was a draw in January 2014 that produced three red cards, six goals, two penalties and one hat-trick. A Stevie May double had St Johnstone 2-0 up after 49 minutes, with Dale Carrick reducing the deficit on 58 minutes. May scored his and Saints’ third goal of the day with his second penalty of the match on 62 minutes, but Sam Nicholson and Danny Wilson secured an unlikely draw with two goals in the last two minutes. Steven Anderson was sent off for Saints on 21 minutes, while Ryan Stevenson (89) and Alan Mannus (90) also saw red in an explosive final five minutes. Key battle: Midfielder Peter Haring will have to keep a close eye on St Johnstone attacker Matty Kennedy. The former Hibs loanee has been in fine form for Tommy Wright’s men in recent weeks and could provide the spark from the No.10 role. Key stats: Hearts haven’t won on league duty in Perth since November 2010, when goals from Kevin Kyle and Ryan Stevenson secured a 2-1 win. The Jambos’ last victory in Perth was an extra time win in the Scottish Cup in February 2012. Former Saints striker Steven MacLean is the Jambo with most shots on goal, while Peter Haring has won 24 free kicks for Hearts. Referee: Andrew Dallas takes charge of his 15th Hearts match, having overseen six wins, five losses and three draws so far. He has handled one previous meeting between tonight’s teams – a 1-0 win for Hearts at Tynecastle in February this year. Assistant referees are Sean Carr and Daniel McFarlane, with Barry Cook on fourth official duties for the evening.